You were kinda expecting Rice-A-Roni nails, weren't you? Turns out I'm just not very good at post tiles. It was almost "Stamp Francisco". Really. 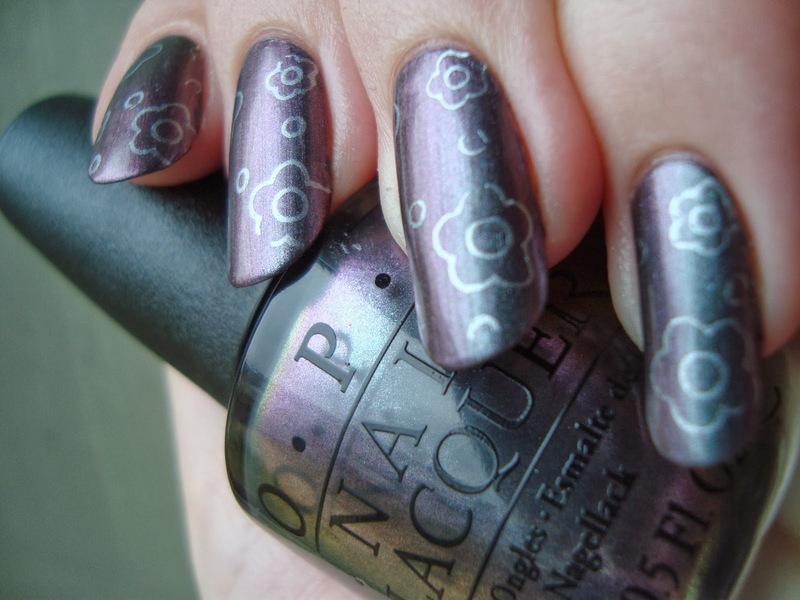 Today I've got the stamping I did over my two picks (so far) from OPI's oh-so-tempting San Francisco collection. I keep seeing other people's photos of various other shades from that collection and kicking myself for not buying them too. I'll be getting at least 2-3 more of them sometime, I'm sure. I'd been desperate to stamp for a few weeks, because my nails had outgrown my plates. Now that they're shorter again, expect to see a lot of fauxnad action. I have plates from MoYou and Messy Mansion on their way, so it won't be 'all Cheeky, all the time' anymore either! Both of the stamping looks I did for this post used Cheeky Happy Nails...of course. It'll be great to have more options. I love that plate endlessly, but even 49 full-nail images are starting to feel limiting. I used the same polish to stamp both too. It's Sally Hansen Platinum Star from the Rodarte Fall '13 collection, which I bought on clearance...um...somewhere. I wanna say it was Target. I didn't buy it when the collection was new, but the more I glanced at it, the more I saw its stamping potential. It's ideal! I used the third image in the first row over Muir Muir On The Wall. I sorta went with a '60s theme for both of these. This image reminds me of polyester shirts, so I guess it's really more '70s, though it also reminds me of mid-century home decor. It's got that space-age-y feel either way. You can see Platinum Star stamps beautifully. For Peace & Love & OPI I used the first image in the last row. This also reminds me of old polyester shirt designs (and kinda fried eggs too). I lived in that kind of stuff as a teen in the '90s, stuff with little plastic collar inserts and other people's cigarette burns. It was as bad as it sounds. I had a little bit of trouble with the image, but it turned out ok. I did this one first and I think I was just out of practice. Cheeky images in general seem to work pretty well. I was so disappointed when I realized that my shortened and re-rounded nails were still too long for my other Cheeky plate, Jumbo A, that I actually shortened them yesterday specifically to make the plate fit. I missed stamping that much! You can get a few sneak peeks over on my Instagram profile, if you'd like an early look. I haven't been on there that long, but I'm enjoying it a lot and I post what I'm working on fairly often. It's also full of cats, so I love it that much more. Love the stamping! Stamping is always the first thing I do when I cut my nails too!